The 800-year history was not only a time of merchants but also artists who still abound in our city. Toruń has huge theatrical traditions and modern cinema halls. You will come across connoisseurs of philharmonic but will also be entranced with the liveliness of culture during city festivities. And at night you can spend a romantic time in the light of flaring fireworks. Toruń has always been perceived as a cultural city due to the artistic and cultural heritage of the city. Most of the buildings, squares, towers and bastions of the city witness a history of intertwining cultures mostly Polish and German, Catholic and Protestant. The following centuries left the print of many cultures, languages and religious beliefs. The air of tolerance and the wealth built on trade made culture, science, and art flourish. Today, works by outstanding Toruń masters can be admired in museums, churches, and galleries. Year after year Toruń attracts ever bigger crowd of tourists who willingly come back because, in addition to the well-known places of historical interest, the city offers variety of cultual events no to be missed by visitors to the birthplace of Nicolaus Copernicus. Toruń is a city where things happen. Every year sees about 1,500 cultural events; some of them are for the general public while others are usually intended for limited and more discriminating audiences. The city of Nicolaus Copernicus takes pride in its professional theatre companies and museums. There are several art galleries, cultural centres, cinemas and numerous clubs where concerts and exhibition previews are held. From among hundreds of small and big events, the following are definitely worth a special mention: Toruń Festival of Science and Art, ‘Probaltica’ International Festival of the Baltic States’ Music and Art, ‘Toruń – Music and Architecture’ Summer Festival, ‘Kontakt’ International Theatre Festival, ‘Klamra’ (Clinch) Academic Theatre Meetings, Toruń Book Festival, Toffifest International Film Festival, ‘Song of Songs’ International Ecumenical Festival of Christian Music, Od Nowa Jazz Festival, Toruń Blues Meetings, New Art Fair and the International Puppet Theatre Festival. 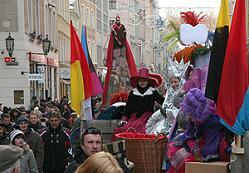 The cultural season lasts in Toruń throughout the year. One of the most showy events that take place in Toruń Old Quarter streets and squares are open-air staging of Toruń important historical moments and events. There were many of them over the eight centuries of Toruń's history, thus almost each year gives an occasion to celebrate and commemorate an anniversary. Three hundred years ago the Great Northern War (1700-1721) passed through the Polish lands. The conflict had tragic consequences for the Poland-Lithuania Republic of Both Nations. Formally neutral Poland for many years was the arena for the battles of Swedish, Russian, Saxon's, Polish and Lithuanian troops. Army marches were accompanied by looting, confiscation and contributions. In the times of a Polish-Swedish rivalry for control over the Baltic Sea there stayed in Toruń the Vasa dynasty representatives expelled from their homeland, adhrerents of King Sigismund III and his sons, diplomats, and simple soldiers and the famous commanders. More frequent than ever Toruń was visited in that short period by successive rulers, the city held meetings and war Seym sessions. It was in Toruń that Anna Vasa - daughter of King John III of Sweden and Katarzyna Jagiellonka - was buried. On 27th September 2003 the Old Quarter of Toruń was seized with the Swedish Yellow Infantry Regiment of Gustav II Adolf. The detachment dressed in uniforms stylized to those of the beginning of the 17th century arrived to our city especially on the occasion of the celebration the "Swedes in Toruń. 300 years later" feast. 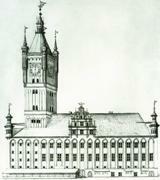 It recalled, inter alia, the Swedish participation in the destruction of the Old Town City Hall in 1703. The impulse to organize that ceremony was the 300th anniversary of the North War with a peak torque - the destruction of the Toruń Old Town Hall on 24th September 1703, which was one of the most significant events in the history of Toruń. Opening of the exhibition "The Swedes in Toruń" in the Old Town City Hall, the symposium, ecumenical service in the St. Mary's Church, evening concert of classical music at the Old Town Market Square, coupled with the fireworks show - that were the main points of the festival. In 1454 Toruń along with the regions of Vistulian Pomerania and the Chełmno Land has been incorporated into the Kingdom of Poland. On 6th March 1454 King Casimir Jagiellończyk gave an incorporation act, according to which the Prussian lands were connected to Poland. On 28th May 1454 under the walls of Toruń Old City Town Hall the public homage by the inhabitants of Toruń was given to the King and his wife, Elizabeth Rakuszanka. It was the Prussian League's Secret Council residing in Toruń that renounced its allegiance to the Teutonic Order in 1454 and sent the Prussian delegation to Krakow to announce the incorporation, which in consequence led to the 13-year War that concluded in 1466 with the Secon Peace of Toruń. 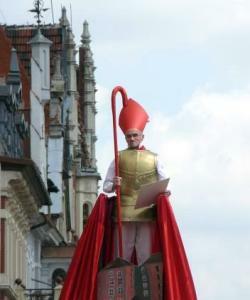 On Saturday 29th May, 2004 the ceremony on the occasion of 550th anniversary of Toruń tribute was held. On 28th May 1454 cities and towns of the Chełmno Land gave on Toruń Old Town Market Square the oath of fidelity to the Polish King Casimir Jagiellończyk. The anniversary ceremony consisted of among others concert in the market square and the staging of events prior to 550 years. The occasional exhibition of the memorabilia from the 13-year Polish-Teutonic War (1454-1466) was one of the points. The main point of the ceremony was the staging of the tribute submitted by residents of Toruń by the walls of the Old City Town Hall. The roles of King Casimir Jagiellończyk and of Queen Elizabeth Rakuszanka were held by the opera soloists. Napoleon stayed in Toruń on 2-6 June 1812. He arrived here after his several-thousand army going through Toruń to war with Moscow since the spring that year. While in Toruń, he visited St. Johns’ Church and the building he believed to be Copernicus’ House, inspected the guard troops deployed along the fortification line and dictated thousands of letters. Although the great Emperor stayed in Toruń only in 1812, the Napoleonic period for the city started as early as the late 1806 and lasted until the Congress of Vienna in 1815. The period proved utterly disastrous to the city, leading it to ruin. Especially disastrous were the events of the early 1813 when the defeated and again. The extensive fortress of Toruń became an important defensive point which, however, was defeated in April 1813 despite the support Toruń received from the Bavarian troops of over 4 thousand people. It was in honour of the nearly thousand Bavarians killed during the defence of Toruń that the Bavarian government built a special monument in Toruń in 1888. More on Napoleonic period in Toruń here (in Polish only). Reconstruction of the historical events of 1806 associated with Napoleon were taking place in Toruń Old Quarter in 2006. In the festival the cavalry, army and garrison orchestra took part. During the show at the place where Napoleon used to stay at the Old Market Square in 1812, a memorial plaque was unveiled. Napoleon period in Poland lasted only seven years, but left persistent traces. Toruń played part in it as well. For many months the city became a hospital and garrison for troops of Napoleon. In respect of improvement of the Toruń fortress, the French pulled down some historical buildings, among others Gothic St. George Church and the cemetery of St. Catherine. While in Toruń Napoleon stayed in the White Eagle Hotel, which once had been located in the Old Market Square, in the current post office site. Napoleon was interested in particular in bridge, which could shift its troops from Eastern Prussia to Greater Poland (Wielkopolska). As part of the festival the exhibition "Napoleon - Poland - Toruń. In the 200-anniversary of the French entrance to Toruń" was organized at the District Museum. 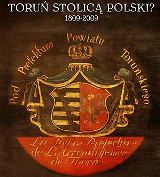 The year 2009 marked the 200th anniversary of the Polish/Austrian war of 1809, when Toruń temporarily served as an administrative capital of the Duchy of Warsaw (Księstwo Warszawskie). 25 April 2009 saw the arrival of Prince Joseph Poniatowski, accompanied by 150 soldiers who encamped in the area of the Old City, to the Old City Market Square, while the Vistula grasslands witnessed the victorious year-old battle of Toruń against the Austrians. The open-air shows celebrated the memory of the events of 1809. The struggle, which was part of Napoleon's War against the Fifth Coalition, was fought single-handedly by the Polish army under the command of Prince Joseph Poniatowski, initially backed by the Saxon troops near Raszyn. Toruń fortress, defended by General Woyczyński's troops, resisted Austrian squads, which, following the defeat, headed for Poznań. Failed by the Prussians and faced with more and more extensive transportation routes, they were unable to put up the blockade around Toruń and, subsequently, around Poznań, where J.H. Dąbrowski's army was stationed, and were forced to retreat to Warsaw. The idea behind organizing the open-air events within of the 9th Toruń Festival of Science and Art was to mark the fact of moving the Central Government from Warsaw to Toruń and making the latter a temporary - yet still important - capital of Poland. Even before April 25 historically dressed soldiers appeared in the Old City. Stationed in the Castle Moat camp, they made trips to the Old City to encourage the active participation of Toruń inhabitants and tourists in the Saturday show. The main event took place on April 25, beginning with a defilade at 11.30 from the New City Market Square. It proceeded through Szeroka Street to the Old City Market Square, followed by the triumphant arrival of Prince Joseph Poniatowski. Welcoming speeches ensued and were rounded of by Napoleonic drills and typical Prussian punishment by the pillory. Copernicus monument erection act of 1809 was read. Reminiscent of former times, e.g. when Toruń was Poland's capital, the State Council session was held on the District Museum courtyard. Especially attractive appeared the staging of General Woyczyński's trip to the city embankment coming under fire, which he made in his bed. The onlookers received commemorative lapel badges. At one o'clock the soldiers joined forces and marched into the battle fought on the Vistula grasslands. The final attraction of the annual Days of Toruń City Festival are open-air opera presentations. 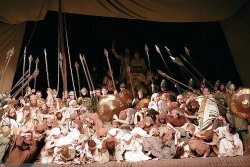 On the first Sunday in July in the moat at the Teutonic Castle ruins the shows are given by the troup of Bydgoszcz Opera Nova. The events always take place in the evening, which makes them even more showy. Their organization is not easy, however. Open-air staging is totally different from the performances, which are issued every day on a permanent stage. Here the scene is built from scratch. One should ensure a sound, or install microports. The orchestra must also be protected from the wind and be covered. This is a big challenge for the technical team. While the original scenography and background are the walls of a Gothic surroundings. Admission is free. For viewers usually waits 1,200 seats and besides there is the possibility of standing watch. 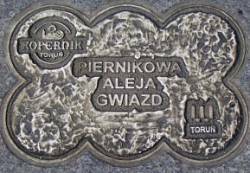 On the pavement outside the Arthus House, there is the Gingerbread Walk of Fame (Polish: Piernikowa Aleja Gwiazd), initiated in 2003. The pavement plaques, shaped like the gingerbread "katarzynka", feature the autographs of the famous people who were either born in Toruń or are associated with the city. Each year in June, in the presence of the honorees, the successive two plaques are unveiled. The first four unveiling ceremonies involved Aleksander Wolszczan, the astronomer, Grażyna Szapołowska, Małgorzata Kożuchowska, Bogusław Linda, the actors, Regina Smendzianka, the pianist, Leszek Balcerowicz, the economist, Janusz Leon Wiśniewski, the writer, and the rock band Republika. Who does not know the world famous San Fermin Festival in Pamplona, Spain, which the city is famous for? 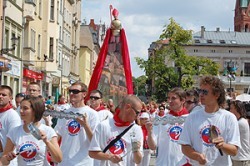 In 2009 Toruń took part in it for the second time connecting with its Spanish friends in the joyful fiesta. In this way, we remember also that the two cities were fighting together for the title of European Capital of Culture in 2016. San Fermin or feast in honor of St. Fermin, in Pamplona, is celebrated annually in the first half of July. It is famous mainly for encierro - the running of the bulls through the streets of the city. The participants can be recognized after the dressing - they all have a white dress with red shawl (panuelo) and shall be girded with red scarves (bufanda). And they loudly sing and dance in honor of Saint Fermin. 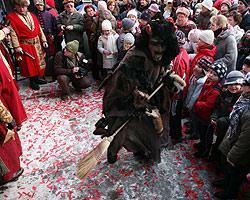 Fun moves to the streets of the old town and the surrounding squares and lasts until dawn. 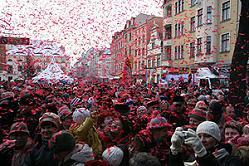 In 2009 in Torun, we combined with the joyous Fiesta of Pamplona. On the streets of the Old Quarter flags of both cities were hung. There was also a scene where the Spanish dances were presented and flamenco concert as well. Children could also count on good fun - did not run out of competitions with prizes and cultural attractions. It should be added that Pamplona sending information about this year's San Fermin to the world news agencies, also posted information about Toruń. Despite frost, hot Spanish spirit pervaded Toruń on 4 January 2009. 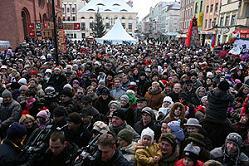 The Three Kings Parade, similar to the one organized in Spain during the Feast of the Epiphany, filled the streets of Toruń’s Old Quarter. The event was yet another manifestation of cultural cooperation between Toruń and Pamplona, which both were aspiring to the title of European Capital of Culture 2016. In Spain, the Three Kings Festival provides the opportunity to organise great street celebration, when whole families take to the streets to join in. 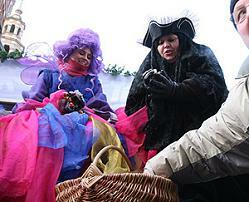 The Kings offer a great variety of sweets to children during the parade, including black ones to those who misbehaved. 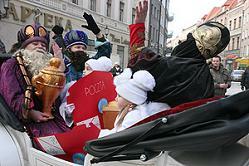 Unlike in Poland, Spanish children receive their presents only on the Three Kings Day. One of the traditions on that day is to eat a round, Three Kings cake containing a surprise inside, which is supposed to bring luck to the lucky finder. Some of those beautiful traditions formed a part of the festival organized on the initiative of the city authorities in the Old Quarter of Toruń. On January 4, the Sunday preceding the Feast of Epiphany, the city witnessed the Three Kings Parade, modeled on the Spanish celebration of that day in Pamplona. The event was marked by the visit of Angel Tellechea Goyena of Pamplona, the honorary consul of Poland in Navarra, the Basque Country and La Rioja. The parade of the Three Kings, actors, dancers, musicians, horse riders, rifle club members and the Teutonic Knights started at 2 o’clock at the Old City Town Hall. Led by St John the Baptist, Toruń patron saint, the procession headed for the crib customarily located in the Toruń New City. 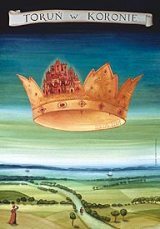 The kings traveled in a hackney carriage, while medievally-dressed children and fairies seated in a fairy vehicle treated the on-lookers to candies and Toruń gingerbread. The parade was not devoid of the Devil who, waging his broom and sprinkling hell soot, reminded the crowd of possible consequences of straying from the right track. 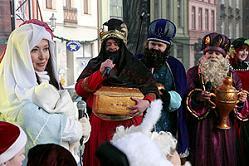 The Three Kings received a warm welcome in the New City Market Square on the part of the city authorities and – as befits Toruń – the very Nicolaus Copernicus. Deputy Major Zbigniew Fiderewicz gave the Kings the account of Toruń children’s conduct throughout the year (to the benefit of the latter), while Consul Angel Tellechea Goyena, greeted the guests and Toruń burghers on behalf of the whole city of Pamplona. Then on the square appeared Mother and Child led by the angels. The Saviour’s birth was announced to all and soundry: red confetti soared skyward over the New City Market Square, abundantly covering the crowd with a red cloud. The mutual caroling ensued, followed by tapas tasting (Spanish sandwiches with a variety of fillings), prepared in tents scattered over the city square especially for Toruń inhabitants. Finalny, girls’s choir Portamus Gaudium under direction of Agnieszka Brzezińska sung the selection of Spanish carols, repeating the performance later in the afternoon in the Old City Town Hall. The movie is just a crowd of interminable and excruciatingly boring and loathsome this scenes of tribe talking at tables in various languages.